Nobody in the UK has had a say on our membership of the EU since 1975. I believe it’s time for your voice to be heard. Since being elected in 2010 I have worked as hard as I can to represent all of the residents in the Rochester and Strood constituency, however they voted, and regardless of how party whips might want me to vote in Parliament. As the local Member of Parliament for Rochester and Strood, I have consistently campaigned for an EU referendum. I believe Britain should be an independent country, trading with Europe but governing ourselves and controlling our own borders. I won a Parliamentary vote to secure the first ever cut to the European Union budget, as well as persuading the Prime Minister to agree an In/Out referendum on our membership of the European Union by 2017. It has been nearly 40 years since the British people last had their say on Europe. In that time, so much has changed – the countries involved, the powers devolved, the benefits and costs of membership. People feel that the EU is heading in a direction they never signed up for which is why I believe residents in my constituency deserve a say. This is not about party politics or the next general election. Fundamentally this is about democracy, and giving people a chance to decide, once and for all, whether the EU is right or wrong for Britain. 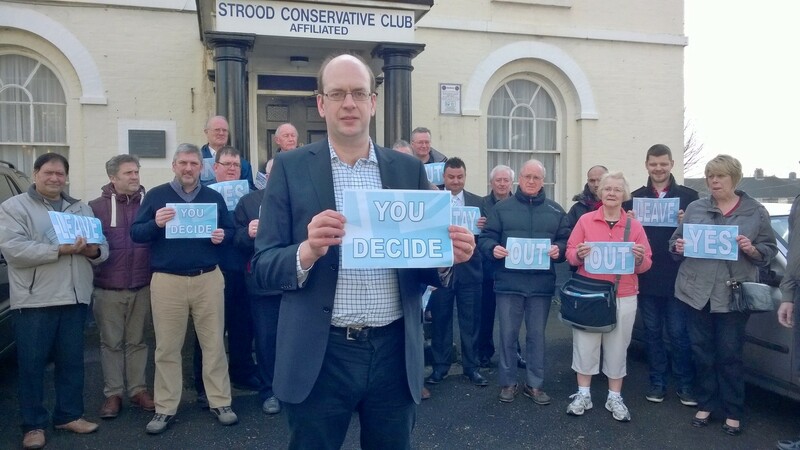 I shall be launching my referendum campaign at 10am on Saturday 1st March at the Strood Conservative Club, 49 Cuxton Road, Strood. Freepost reply ballots will be sent to every household in the Rochester and Strood constituency over the following week or you can vote online by clicking here.